Brilliant splashes of color, textures, and artistic statements. 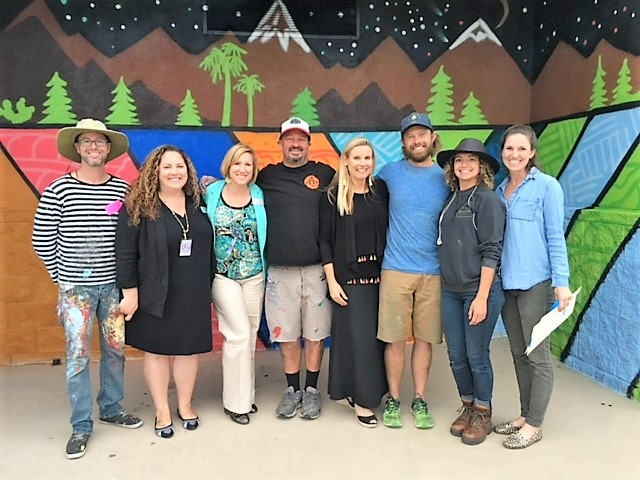 What began as teacher Nicole Moersch’s vision has become an inspiring installation of art, as four new murals fill Aviara Oaks Middle School’s (AOMS) campus with color and creative expression. 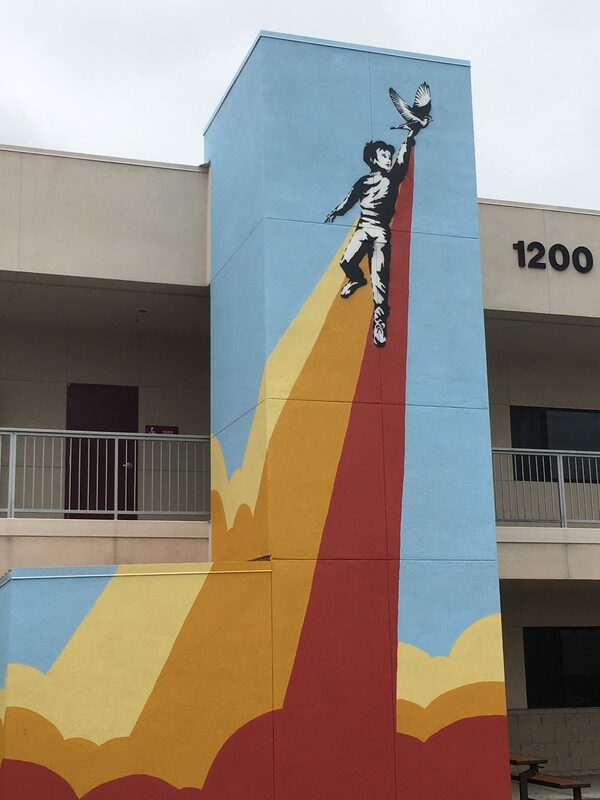 Last year Ms. Moersch, along with music and ASB (student leadership) teacher Marina Hall, conceived a plan for a community collaboration to bring public art to their campus. They proposed a mural project to AOMS administrators Bryan Brockett and Julie Steitz as a way to build connections among the AOMS faculty, students, families, and the community. Approvals were secured, and the students held a carnival to raise funds for equipment and supplies. The teachers were able to recruit four talented local artists who were willing to donate their time and artistic prowess to the AOMS campus project. The four North County muralists – Skye Walker, Bryan Snyder, Tierney Moses, and Sean Dominguez — volunteered their time and talents to conceptualize, design, and bring to fruition their works of art on campus, while students observed and interacted with them. Ms. Moersch and Ms. Hall asked for art that would reflect and embody the project’s themes —reaching for dreams, serenity, and community. The artists responded with impressive renderings of their proposals. The project was on. The artists had two days, a lift, and many gallons of paint for creating their artwork. Tierney Moses, the only female muralist of the four, hopes her work inspires the kids and adults on campus. She especially wants to inspire the girls at AOMS to follow their passions. So her mural portrays a woman engaged in one of Ms. Moses’ passions —-skateboarding. She wanted AOMS students to see a strong, confident woman attaining what she has striven for, whether as a doctor, a musician, a lawyer, or a professional skateboarder. 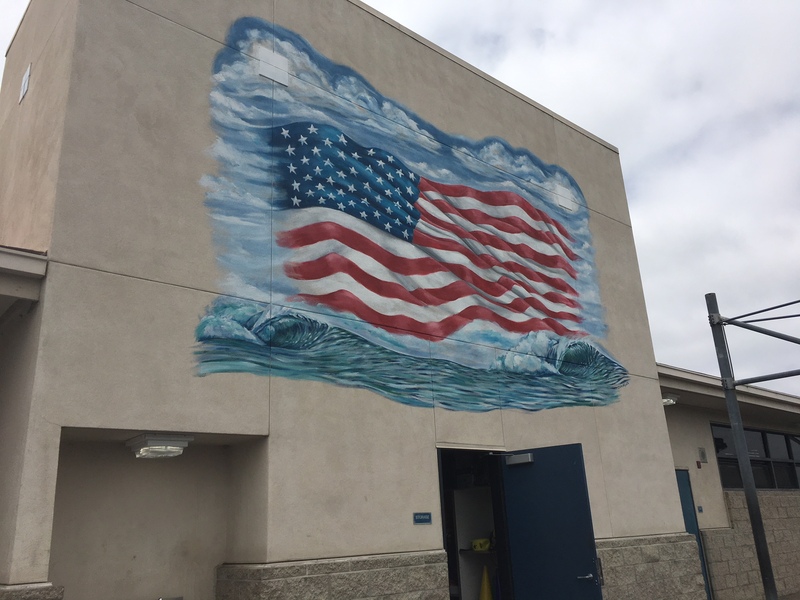 Artist Sean Dominguez created an evocative mural of the American flag, billowing in the breeze over a churning ocean, that the students in AOMS P.E. classes can salute as they recite the Pledge of Allegiance on the tarmac each morning. Mr. Dominguez and Mr. Snyder also worked together recently on another local public art project, the “Colors of Carlsbad” on the Carlsbad Art Wall, in an exciting collaboration with Visit Carlsbad. The school appreciates the chance to showcase the work of these talented local artists, and to motivate all AOMS students, especially those interested in the Visual and Performing Arts, to create their own art.